The day is not far off when we will see an update that will bring a lot of new things to the seas, rivers, lakes and oceans. More details can be seen here - The Update Aquatic, the release will take place in about two to three months, according to Mojang employees. 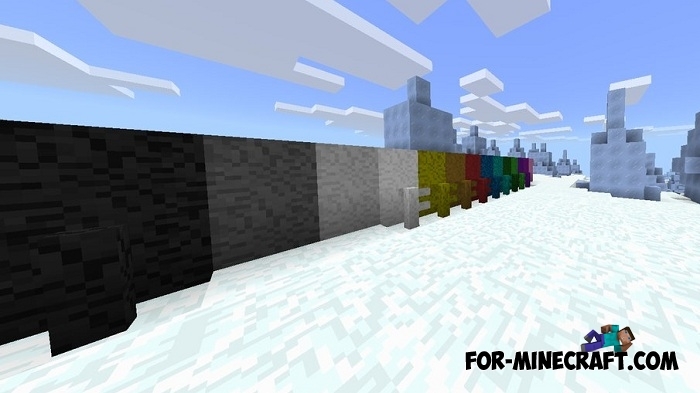 This update will affect not only Java 1.14, but Minecraft PE 1.3 Bedrock (or probably 1.4). This news pushed addon makers to take on the development of expected features and implement them in MCPE 1.2. This time, you will see the conceptual corals and fences shown on Minecon 2017. Corals are new underwater blocks that can be seen only on the bottom of the seas. Corals are of different colors that suggests the use of them in the construction of bright structures. Fences already exist in the game, but only wooden ones. The addon adds new types of coral fences with a standard shape. And yes, in The Update Aquatic, the water will get physical properties and can flow through the cracks and holes including the fence. Villagers are the only way to get new items. Trade with them and eventually you will be able to purchase colored fences and corals or type the following commands: / give @s [fence / prismarine / planks] to instantly receive items. How to install the Corals and Fences addon?